Vandur is an 18’ tall Titan, weighing 800 pounds. He has an athletic build that is not overly muscled, with shoulder length blonde hair which has been brushed back out of his face. He has warm amber eyes. 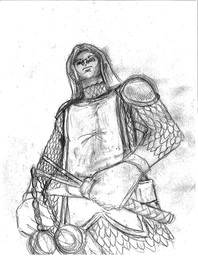 Vandur typically wears scale mail that covers his entire body. A sleeveless blue tabard hides most of the torso armor, with its bottom hem going down to his mid-thigh. He wears the tabard belted at the waist. Completing his ensemble are knee-high leather boots. Picture from thegreymile. Full size picture can be found here. Has a mount, a Great Gryphon named Ruska. Vandur hails from the Northern Hinterlands, where he spent much of his youth with his elder sister, Vess- a fellow follower of Hoknar; where they both tried to keep the Northern Mountains a safe place for others. The two spent a lot of time wandering up and down the mountain range until she decided Vandur was old enough to explore the world on his own. And explore it he did, though early on he mostly stayed near the mountains. This was the time when he found Ruska. In his travels around the Hinterlands he came upon grisly scenes more than once, but none affected him more than finding a small family group of Wolfen that had become trapped in the snow and slain by monsters. Having arrived too late to have helped them, Vandur buried the dead as best he could to try and give them what peace could be found. During this he found a young Wolfen child, Rana, that had been hidden away during the attack. Conflicted on the course of action he should take with this new discovery, Vandur settled on taking her with him, at least until a new family could be found. Being unable to speak the Wolfen language made this more difficult, but the two were able to use sign language to get the basics across. They eventually started seeing each other similar to family as Vandur attempted to find a suitable home for Rana, but with them growing close he decided instead to adopt her as his ward instead with the intent of raising her. It was this that encouraged him to start up a Hearth & Home at the base of the Northern Mountains, providing a place of protection to those in need; so long as they had good intentions toward others. Due to the location being near the Shadow Colonies, Vandur would often trade with those in Outer Cadeth (Vandur had attempted to trade in Lothen, but was shunned with each try and decided his time would be better spent elsewhere). During one of these trips he was inspired to go visit the Pyramid of Osiris in Inner Cadeth, curious about how the religions views differed from his own. He was only allowed to gaze from afar, but the sight and stories from the priests encouraged him to worship Osiris instead. After several visits and much deliberating on the matter Vandur decided to take the next step; to visit Haven. There was still the matter of who would operate his business while he was away, but he settled on letting Rana take over ownership now that she was grown. Not to mention he knew that his sister would occasionally drop by to check on things, so he felt things would be well taken care of until he returned. Vandur was born under the sign of nature and beauty. Those born under the sign of the unicorn seem to be wild at heart and at home in nature.